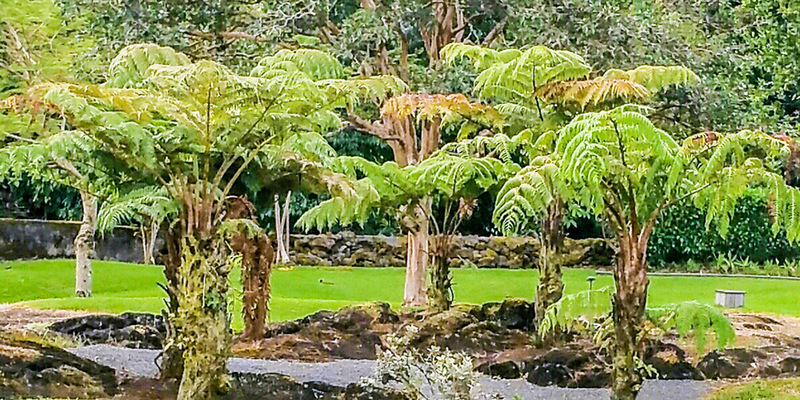 The largest ferns in Hawaiʻi, (Cibotium glaucum and C. menziesii). 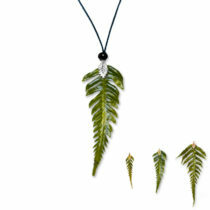 From the coastal sea level up to about 1500 ft elevation, they grow up to 25 ft. high with 9 ft. long fronds (leaves). They grow less tall higher up, especially above 4,800 ft. Hapuʻu (pronounced “hapoo-oo”) grow sparsely throughout all the Hawaiian Islands except in the rainforest conditions of Volcano and Hilo on the Big Island of Hawaiʻi, where they are abundant and spectacular. They are endemic to Hawaiʻi. The pithy core was a staple in times of food shortages; medicinal uses included blood purifying and alleviating joint stiffness, chest and muscle pains. Outer trunk fibers were for basketry, softer fibers (pulu) were used as cushioning in pillows and mattresses, and for absorption and drying. Hapuʻu grows either rooted in the ground or, when lodged into other plants or trees, living from nutrients solely taken from the rain and air around them. Many beautiful Hapuʻu grow on our studio grounds. We only cut our small requirements from living healthy plants that quickly regrow, hence our product is self sustaining. No plants are destroyed or die from our harvesting. There is nothing quite like our natural accessories and jewelry as they are designed to remain very close in appearance and flexibility to the original live flowers or plants and yet be practical to wear on a long term continuous basis. This is particularly so with our Hapuʻu all being of their original color and flexibility, not fashion color items. 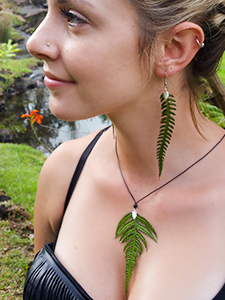 Our Hapuʻu fern leaves have been treated with the same preservative as our orchids shown elsewhere on this site. However the method of application has been adjusted to best suit the structure of the fern leaf, which is more fibrous, and has a spine down the center length. 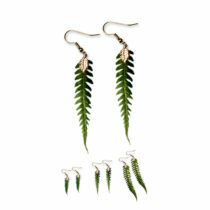 Nevertheless they are durable, pliable, virtually weightless and certainly practical to wear.